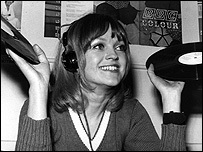 Annie Nightingale is BBC Radio 1's longest-serving DJ, having first appeared on the station in 1970. Once a champion of progressive rock, she later turned her attention to dance music and has been a stalwart of the station's late night schedules for more than a decade. Over the years her career has taken her into journalism and television, as well as presenting Radio 4's Woman's Hour. She was made an MBE in 2002. Now she is celebrating her show's second success in the Breakspoll awards for breakbeat music - and has just released a new compilation album. Tell us about the Breakspoll award. It's the Oscars of the breakbeat world. Last year I won best radio show and I managed to win it again. I present the awards as well, and I was standing up there in front of all these people, thinking 'I'm not going to win' because I don't want to end up disappointed. You know what happens at all the larger awards ceremonies, where they cut to the person who hasn't won to look at their face? That was all going on in the back of my mind. It was very nice, and very good of them. Being part of the BBC, we have such a wonderful website - that's the way we reach people. The music is very much internet-driven. Which internet radio stations would you recommend? There are people devoted to internet radio, like Nu Skool Breaks - purely pirate radio, devoted to breakbeat. Then there's iBreaks, then there's Bijou Breaks based in Los Angeles, so it's a huge, growing, and very worldwide thing. I've just had a message on my MySpace site from a girl in Vladivostok who's a breaks DJ. I get really excited about that. And I think, "Oooh, can I come over, I've always wanted to go there?" Because of the internet, you can reach all around the world. It was always my dream on Radio 1 - "this is fantastic music, I wish we could reach out to everyone in the world". And now, we can. I've always liked that interactive aspect. I had a guy write to me from Jordan recently, that's not a place you'd imagine is really getting into beats, so I feel quite evangelical about it. How did the Y4K album come about? It's in a series, and the label's called Distinctive. I went to them last year when I won the award, and said, "Hey, how about doing a compilation?" I did one about 12 years ago [Annie on One] and that did really well. It's taken me exactly a year to get this one right. I've loved it. It's like doing a radio show but even more refined. It's been a journey of discovery. Is it still more difficult for female DJs? It's a lot easier now in radio - look at Radio 1. I'm very proud of the fact you've got Edith Bowman, Jo Whiley, Annie Mac, Fearne Cotton - who I think is fantastic - and Mary Anne Hobbs. There's probably as many women now on Radio 1 as blokes. It's not an issue any more. But it's a lot tougher club-wise, and breaks is very 'blokey'. In Breakspoll, in all the nominations there was only one woman besides me, Janette Slack, and that's the first time another female has been mentioned. They're not horrid or anti-women, there are just too many blokes! I don't think it's necessarily blokes' music. That's another thing I want to get across with this album. But I won't make any girlie concessions - I don't believe in that. The first couple of tracks are slightly funkier and it gets the girls onto the dancefloor while the guys stand there with their woolly hats on nodding. You've got to get the girls on the dancefloor and the guys follow. You should really have a psychology degree if you want to be a club DJ, to understand that sexual trigger. Muzik magazine once named you Caner of the Year. What's your favourite honour? That one. Wouldn't it be yours? I said to them, "why me?" and they said: "Everywhere we've been partying, you've been there. Miami, Ibiza, for dedication to the cause." As well as your Radio 1 show, what else are you working on? I'm working on an idea for a book and a TV series. There's nobody else who started where I did, and look what I've done. I'd just like to tell the story. A friend of mine, David Holmes, who's a very famous DJ, and now a Hollywood composer, put together the music for Ocean's 11, Ocean's 12 and Ocean's 13. He said to me, 'you should be doing this.' So I go roaring over to LA, I think, "yeah, we'll crack Hollywood in 10 days" - except you don't, but you don't realise you haven't because they're so charming and they big you up so much. It's a big learning curve but it's the only part of the media I haven't worked in. Film is the one elusive thing, like the moon that keeps going behind the clouds. I have great respect for anyone who gets movies made, you've got to raise all that money. But I have a project with that, and that's ongoing. Annie Nightingale Presents Y4K is out now on Distinctive Records, and she can be heard on Radio 1 between 0200 and 0400 BST on Mondays. She talked to BBC News entertainment reporter Darryl Chamberlain.